Parkinson's disease (PD) is the second most prevalent progressive neurodegenerative disease. Although several hypotheses have been proposed to explain the pathogenesis of PD, apoptotic cell death and oxidative stress are the most prevalent mechanisms. Tetramethylpyrazine (TMP) is a biological component that has been extracted from Ligusticum wallichii Franchat (ChuanXiong), which exhibits anti-apoptotic and antioxidant roles. In the current study, we aimed to investigate the possible protective effect of TMP against dopaminergic neuron injury in a rat model of Parkinson's disease induced by MPTP and to elucidate probable molecular mechanisms. The results showed that TMP could notably prevent MPTP-induced dopaminergic neurons damage, reflected by improvement of motor deficits, enhancement of TH expression and the content of dopamine and its metabolite, DOPAC. We observed MPTP-induced activation of mitochondrial apoptotic death pathway, evidenced by up-regulation of Bax, down-regulation of Bcl-2, release of cytochrome c and cleavage of caspase 3, which was significantly inhibited by TMP. Moreover, TMP could prevent MPTP-increased TBARS level and MPTP-decreased GSH level, indicating the antioxidant role of TMP in PD model. And the antioxidant role of TMP attributes to the prevention of MPTP-induced reduction of Nrf2 and GCLc expression. In conclusion, in MPTP-induced PD model, TMP prevents the down-regulation of Nrf2 and GCLc, maintaining redox balance and inhibiting apoptosis, leading to the attenuation of dopaminergic neuron damage. The effectiveness of TMP in treating PD potentially leads to interesting therapeutic perspectives. Keywords: Tetramethylpyrazine, Parkinson's disease, anti-apoptotic, antioxidant, MPTP. As a the second most prevalent progressive neurodegenerative disease, Parkinson's disease (PD) is characterized by a loss of dopaminergic cells in the substantianigra pars compacta, and movement dysfunction, including progressive resting tremor, rigidity, bradykinesia, and postural instability . The incidence of PD increases with age , and PD affects about 6% of those over the age of 65. Even in the early stages, PD can lead to significant dysphagia that negatively impacts the quality of life . Although several hypotheses have been proposed to explain the progress in PD, oxidative stress is the most prevalent mechanism [4-6], which has been believed to be linked with PD for a long time. Oxidative stress-targeted activation of mitochondrion-dependent programmed cell death pathways  is instrumental to dopaminergic neurons in experimental mouse models of PD . In vitro and in vivo studies of PD models evaluating natural and endogenous antioxidants such as polyphenols, coenzyme Q10, and vitamins A, C, and E, have shown protective effects of antioxidants against oxidative stress-induced neuronal death . Description and management of PD could be found in ancient medical systems . Traditional Chinese medicine (TCM) is one of the most ancient and still largely used traditional medicines [11, 12]. Tetramethylpyrazine (TMP) is a purified chemical that has been identified as a component of Ligusticum wallichii Franchat (ChuanXiong), a Chinese herb that is widely used in the treatment of neurovascular and cardiovascular diseases. In recent years, several studies have shown that TMP possesses neuro-protective effect in vitro and in vivo [13, 14]. TMP was found to protect ischemic brain damage, and promote cell proliferation and differentiation stimulated by ischemia . Kao et al. reported that TMP possessed neuroprotective activities against cerebral ischemia through elevating Nrf2/HO-1 expression . However, whether TMP exhibits neuro-protective effects in PD is still not known. 1-methyl-4-phenyl-1,2,3,6-tetrahydropyridine (MPTP), is a toxin targeting relatively specifically to those neurons that are involved in PD. Thus, MPTP has been used to develop animal models for testing new therapies in the human PD . The present study was designed to evaluate the protective effect of TMP against neurotoxicity induced by MPTP and to examine the possible role of anti-apoptotic and antioxidant activities of TMP. Bax, Bcl-2, cytochrome c, Nrf2, tyrosine hydroxylase, caspase 3 and β-actin antibodies were purchased from Santa Cruz Biotechnology. GCLc and tubulin α antibodies were purchased from Bioworld Technology. MPTP, TMP and most of the chemicals and reagents used in this study were procured from Sigma. 40 male Wistar rats (the Experimental Animal Center of Fourth Military Medical University) weighing 280-320 g at the beginning of the experiments were used in this study. Animals were fed in a humidity- and temperature-controlled room and were given free access to food and water. All animal experiments were performed according to the procedures approved by Fourth Military Medical University Animal Care and Use Committee. Rats were distributed randomly into 4 groups with 10 replicates in each group: the control group (Con, treated with vehicles), MPTP (MPTP-lesioned group and injection of vehicles) group, TMP group (injected with TMP) and TMP +MPTP group (injected with TMP plus MPTP).TMP (20 mg/kg/d per rat, dissolved in 3% DMSO, i.p.) was administered for 7 days. On day 7, the animals received bilateral stereotaxic injection into the substantianigra (SN) with MPTP (Sigma, USA; 1 μmol in2 μl of saline, 0.35 μl/min) through a 30-gage needle according to the following coordinates: AP: - 5.0 mm, ML: ±2.1 mm, DV: - 7.7 mm from the bregma,midline, and skull surface after 1 h of administration. The method of brain surgery has been reported previously . Following brain lesioning, the rats continued to receive TMP for another 7 days. Ladder walking was conducted at the 14th day at 14:00-18:00 h. At the end of these experiments, the rats were sacrificed and the striatum and SN were dissected for other experiments. The ladder walking test was conducted to estimate the ability of rats to coordinate hindlimb and forelimb. In the test, the rats were required to cross the 'horizontal ladder' by accurately placing their limbs on the bars. Rats were trained to walk across the ladder rung which were irregularly spaced out (1-3 cm apart). The rung space was not altered throughout the experimental period. Rats were trained to walk across the ladder for 3 days before the test and the average performance for three times on the 14th day was recorded. After the treatment, immunostaining was conducted as previously reported . In brief, rats were perfused through the heart under deepanesthesia with 150-200 ml of 4% paraformaldehyde in phosphate buffer, pH7.4. Then brains were removed, and cryoprotection was conducted in 30% sucrosephosphatebuffer, pH 7.4. After that, the brains were frozen at -20℃, and serial sections (5 μm thick) were cut and mounted on glass slides. Nonspecific binding was blocked and cells were incubated overnight at 4 ºC with specific antibodies, and then incubated with Cy3-conjugated antibody. Specimens were examined with a confocal microscopy (Nikon AR1). In striata, the levels of dopamine and its metabolites were detected by HPLC analysis as previously described . The results were calculated and expressed as ng/mg tissue weight. Thiobarbituric acid (TBA) reactive substances (TBARS) and glutathione (GSH) content in substantianigra (SN) homogenate were determined by commercial kits according to manufacturer's protocol. The results were normalized to protein content. Briefly, tissues were prepared by incubation on ice with lysis buffer and centrifuged at 20 000g. Then, the supernatant was collected and protein concentration was determined using the Pierce BCA Protein Assay Kit (Thermo) with bovine serum albumin as a standard control. After that, the supernatant was mixed with equal volume of sample buffer. Then the mixture was boiled for 5 minutes and centrifuged at 10,000 g for 10 minutes. The supernatants were used for immunoblotting. Protein extractions were separated by using SDS-PAGE on 10% polyacrylamide gels, and transferred to nitrocellulose membranes (Millipore, Billerica, MA, USA). After blocking for 1 h with 8% skimmed milk in TBS buffer (10 mMTris, 150 mMNaCl), the membrane was incubated with indicated primary antibodies overnight at 4℃. After the membrane was washed four times for 15 min each with TBST buffer (10 mMTris, 150 mMNaCl, and 0.1% Tween-20), it was incubated in the appropriate HRP-conjugated secondary antibody (diluted 1:5000 in TBST) at 37℃ for 30 min. The protein bands were visualized using chemiluminescent reagents according to the manufacturer's instructions and quantified using an image analyzer Quantity One System (Bio-Rad, Richmond, CA, USA). All protein quantifications were adjusted for the corresponding β-actin or tubulin α level, which was not consistently changed by the different treatment conditions . Results were expressed as the means ± SD and were analyzed by one-way ANOVA followed by a SNK-q test for multiple comparisons. All analyses were performed using the Statistical Package for the Social Sciences (SPSS) software. Data were considered statistically significant for p<0.05. To detect the deficits in limb coordination and limb placing and evaluate the rat's ability to navigate across a run way with irregularly spaced rungs, we conducted the ladder walking test. As shown in Fig. 1, rats in the MPTP group markedly spent longer time in crossing the run way than those of control, confirming that MPTP induced motor deficits. Compared with those of MPTP group, rats in TMP + MPTP group spent shorter time in crossing the run way (Fig. 1). The results demonstrated that TMP prevented against MPTP-induced motor deficits. Effect of TMP on MPTP-induced motor deficits. At the end of the experiments, the ladder walking test was conducted to evaluate the effect of TMP on MPTP-induced motor deficits. * p<0.05, compared with control; # p<0.05, compared with MPTP. 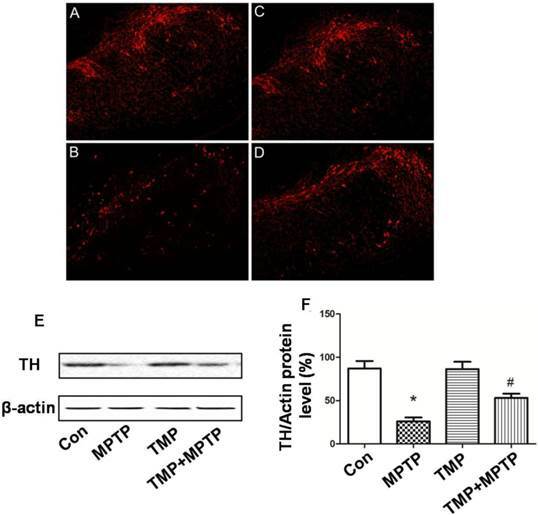 In order to measure the protective effect of TMP on dopaminergic neurons, immunostaining was conducted using an antibody against tyrosine hydroxylase (TH). As shown in Fig. 2, we observed significant decrease of TH-immunoreactivity in MPTP-treated rats (Fig. 2B), compared with that of control. As expected, the administration of TMP could significantly prevent MPTP-induced decrease of TH-immunoreactivity (Fig. 2D). Moreover, western blot was used to measure the protein expression of TH. In Fig. 2E and F, we figured out that, compared with control groups, the expression of TH was decreased after the exposure to MPTP. 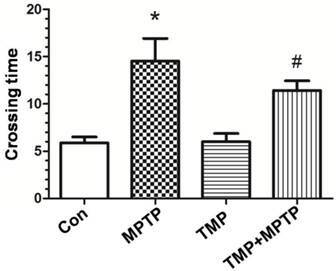 TMP treatment notably inhibited MPTP- decreased TH protein expression, reflected by the results of western blot. Furthermore, we detected dopamine release in SN. Dopamine and DOPAC (3, 4-dihydroxyphenyl acetic acid, a normal product of the metabolism of dopamine) levels were assayed by HPLC. As shown in Fig. 3, MPTP injections in SN resulted in a significant reduction of DA (A) and DOPAC (B). Injection of TMP prevented MPTP-induced reduction of DA (A) and DOPAC (B). The results demonstrated that TMP could prevent MPTP-induced dopaminergic neuron damage. In order to evaluate apoptosis-related alterations, we detected protein expression of Bax and Bcl-2. As shown in Fig. 4A and B, in SN, MPTP injection increased Bax expression and decreased Bcl-2 expression. MPTP-induced changes of Bax and Bcl-2 expression were prevented by TMP administration (Fig. 4A and B). Moreover, we determined cytochrome c release in cytoplasm. As shown in Fig. 4C and D, MPTP injection in SN increased cytoplasmic cytochrome c expression, which was inhibited significantly by TMP. Furthermore, we measured the cleavage of caspase 3 in SN. In Fig. 4E and F, we figured out that the injection of MPTP induced evident cleavage of caspase 3 and TMP administration significantly decreased the expression of cleaved caspase 3 in SN. These data demonstrated that TMP could prevent MPTP-induced apoptosis in SN. Effect of TMP on MPTP-induced dopaminergic neuron damage. At the end of the experiments, immunostaining(A-D) and western blot (E) were conducted to evaluate the effect of TMP on MPTP-induced dopaminergic neuron damage. A, Control; B, MPTP; C, TMP; D, TMP + MPTP. Representative images and blots were shown. The results of western blot were also shown as percentage of control in columns (F). * p<0.05, compared with control; # p<0.05, compared with MPTP. Effect of TMP on MPTP-induced levels of dopamineand its metabolites. At the end of the experiments, the levels of dopamine (A) and DOPAC (B) in SN were detectedby HPLC analysis. * p<0.05, compared with control; # p<0.05, compared with MPTP. Effect of TMP on MPTP-induced apoptosis. At the end of the experiments, protein expressions of Bax, Bcl-2 (A and B), cytoplasmic cytochrome c (C and D), and cleavage of caspase 3 (E and F) were determined by western blot. Representative blots were shown. Results were also expressed as means ± SD (B, D and F). * p<0.05, compared with control; # p<0.05, compared with MPTP. Next, we evaluated the effect of TMP and MPTP on redox balance in SN. In Fig. 5A, the results showed that in SN, MPTP significantly increased the level of TBARS, indicating the occurrence of oxidative injury. The administration of TMP prevented the increase of TBARS level (Fig. 5A). Moreover, GSH content was examined and the results showed that MPTP injection reduced GSH level significantly (Fig. 5B), compared with that of control. In contrast, the administration of TMP could prevent MPTP-induced reduction of GSH content (Fig. 5B). Furthermore, we examined the molecular mechanisms underlying the effect of TMP and MPTP on redox balance. As shown in Fig. 5 C and D, nuclear factor erythroid 2 p45-related factor 2 (Nrf2) and glutathione cysteineligase catalytic subunit (GCLc) expression was reduced by MPTP, compared with that of control. 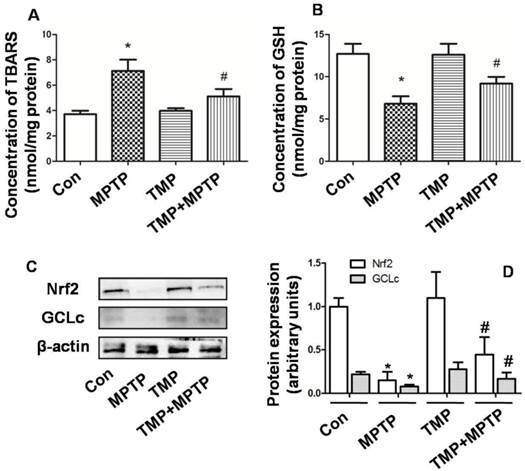 As expected, TMP significantly prevented MPTP-induced reduction of Nrf2 and GCLc expression. These results indicated that TMP could prevent MPTP-induced oxidative stress in SN. TMP is a biologically active ingredient first extracted from the Chinese medicinal plant Ligusticum wallichii Franchat (ChuanXiong), which is widely used to treat coronary artery and ischemic cerebral vascular diseases . In the central nervous system, studies have shown that TMP markedly reduces cerebral ischemia/reperfusion injury through suppression of inflammatory cell activation and proinflammatory cytokine production [21, 22]. TMP has been also shown to inhibit neuronal apoptosis and prevent neuronal loss [15, 23]. In the present study, we investigated the protective effect of TMP on neuron in PD and elucidated possible mechanisms. Effect of TMP on MPTP-induced oxidative stress. At the end of the experiments, TBARS (A) and GSH (B) content were examined by commercial kits. Protein expressions of Nrf2 and GCLc were detected by western blot (C and D). Representative blots were shown (C). Results were also shown as means ± SD in columns (D). * p<0.05, compared with control; # p<0.05, compared with MPTP. In our study, we chose a stereotaxic bilateral injection into the SN with MPTP in the rats to establish a PD model, which could be considered as a good model of early phase of PD . Using MPTP-induced PD animal, we evaluated the protective effect of TMP against neurotoxicity induced by MPTP. We showed that TMP could notably prevent MPTP-induced dopaminergic neurons damage, reflected by improvement of motor deficits (Fig. 1), blockage of the reduction of TH expression (Fig. 2) and the content of dopamine and its metabolite, DOPAC (Fig. 3). The results implicated that TMP exhibited protective effects against dopaminergic neurons neurotoxicity induced by MPTP. A variety of evidence has supported the concept that apoptotic cell death contributes to PD neuronal loss particularly in the nigra . Accumulative evidence from human studies also implicates apoptotic cell death in the etiology of PD . Bax-dependent increases in mitochondrial membrane permeability are responsible for the release of mitochondrial factors that signal for apoptotic degradation, and increased Bax levels have been found in a subset of PD nigral neurons . Various studies have observed protective effects of bax ablation  as well as overexpression of Bcl-2  against MPTP toxicity. In mitochondrion, activation of Bax results in permeabilization of the outer membrane to intermembrane proteins such as cytochrome c. Once released into the cytosol, cytochrome c together with other proteins activates the caspase cascade of protease activities that mediate the biochemical and morphological alterations which is characteristic of apoptosis . In our study, we observed MPTP-induced activation of mitochondrial apoptotic death pathway, evidenced by up-regulation of Bax, down-regulation of Bcl-2, release of cytochrome c and cleavage of caspase 3 (Fig. 4). Previous studies showed the anti-apoptotic effect of TMP in spinal cord , neurons , and renal tubular cells . 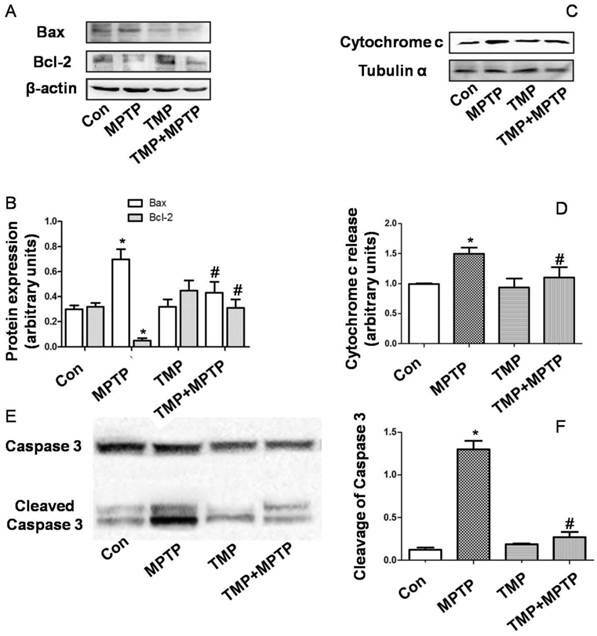 TMP also increases the expression of Bcl-2, but decreases the expression of Bax in the spinal cord , and preserves the mitochondrial membrane potential to protect the neuron against kainate-induced toxicity . In the study, our results confirmed the anti-apoptotic effect of TMP against MPTP-induced dopaminergic neurons neurotoxicity, evidenced by inhibition of up-regulation of Bax, down-regulation of Bcl-2, release of cytochrome c and cleavage of caspase 3 (Fig. 4). The data indicated that the anti-apoptotic effect may contribute to the neuro-protective effect of TMP in PD model. There is no doubt that oxidative damage plays a central role in degeneration of dopamine neurons  and in the pathogenesis of PD . Oxidative stress could initiate mitochondrial apoptosis, which may aggravate oxidative damage, resulting in the vicious circle of “oxidative stress-apoptosis”. As a potent neurotoxin, MPTP has been shown to cause dopaminergic neurodegeneration by the generation of free radicals, leading to oxidative stress. Many compounds, including bromocriptine, salicylic acid, deprenyl, nitroglycerine, aspirin, and paracetamol, have been proved to attenuate MPTP-neurotoxicity by scavenging oxygen free radicals. MDA (TBARS) production could reflect oxidative damage of lipids . GSH is one of the most important antioxidants in the brain which plays a key role in the prevention of oxidative damage . In SN of PD patients and in the MPTP-induced PD model, reduction of GSH has been observed . In the present study, we confirmed the occurrence of oxidative stress, evidenced by increase of TBARS and decrease of GSH induced by MPTP (Fig. 5). TMP has been reported to remove oxygen-free radicals through increasing activities of superoxide dismutase, catalase and glutathione peroxidases [38, 39]. In our studies, the results showed that TMP could prevent MPTP-increased TBARS level and MPTP-decreased GSH level, indicating the antioxidant role of TMP in PD model (Fig. 5). The cytosolic enzymes, including GCL and GSH synthetase, catalyze the synthesis of GSH from glutamate, cysteine, andglycine sequentially . The process of GSH synthesis is mainly regulated by GCL activity, and GCLc is the catalytic subunit of GCL. As a crucial regulator of cellular redox homeostasis, Nrf2 plays a pivotal role in protecting against ROS damage [41, 42], through regulating the expression of a battery of antioxidant enzymes, including GCLc . In the study, we found that TMP could significantly prevent MPTP-induced reduction of Nrf2 and GCLc expression (Fig. 5), which may contribute to the antioxidant and thus anti-apoptotic role of TMP in PD disease. In conclusion, the present study investigated the protective effect of TMP on MPTP-induced dopaminergic neurontoxicity in rats. We found that TMP effectively prevents MPTP-induced motor deficits, and damage of dopaminergic neurons. The anti-apoptotic and antioxidant roles of TMP are central to the protective effect of TMP. Regulation of Nrf2/GCLc by TMP contributes to the antioxidant role of TMP. These data suggest that TMP is a promising candidate for the treatment of PD. PD, Parkinson's disease; TMP, tetramethylpyrazine; MPTP, 1-methyl-4-phenyl-1,2,3,6-tetrahydropyridine; DOPAC, dihydroxy-phenyl acetic acid; TH, tyrosine hydroxylase; TBARS, thiobarbituric acid reaction substances; GSH, glutathione; SN, substantianigra; Nrf2, nuclearfactor erythroid 2 p45-related factor 2; GCLc, glutamate-cysteine ligase catalytic subunit. This work was supported by grants from the Science and Technology Projects of Shaanxi Province (2012K14-05-06; 2011KTZB03-01) and grants from Shaanxi Province (S2010ZDGC105), China. Corresponding author: Dr. Siwang Wang, Institute of Materia Medica, Fourth Military Medical University 169 Changlexi Road, Xi'an, China 710032, Tel. : +86-29-8477-4748 (S.-W.W.); Fax: +86-29-8322-4790 (S.-W.W.); E-Mail: wangsiwedu.cn (S.-W.W.); or miaoqingedu.cn (Q.M. ).